Here's an inside look of the upcoming Serena Williams & Katy Perry collections coming out this January. OPI will be ringing in 2011 with the Katy Perry collection complete with glitter, gun metal & black shatter! 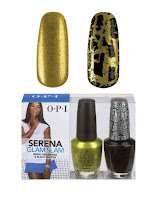 While the Serena collection sold as a two pack, you can get your hands on both "Simply Smashing" and black shatter. This is the first set coming out for the Australian OPEN, and there will be more with more color combos as well! Below is am overview of the collections and how Black Shatter works!